Though I’m no beach person come summer I like to surround myself with things that remind me of the beach and outdoors. 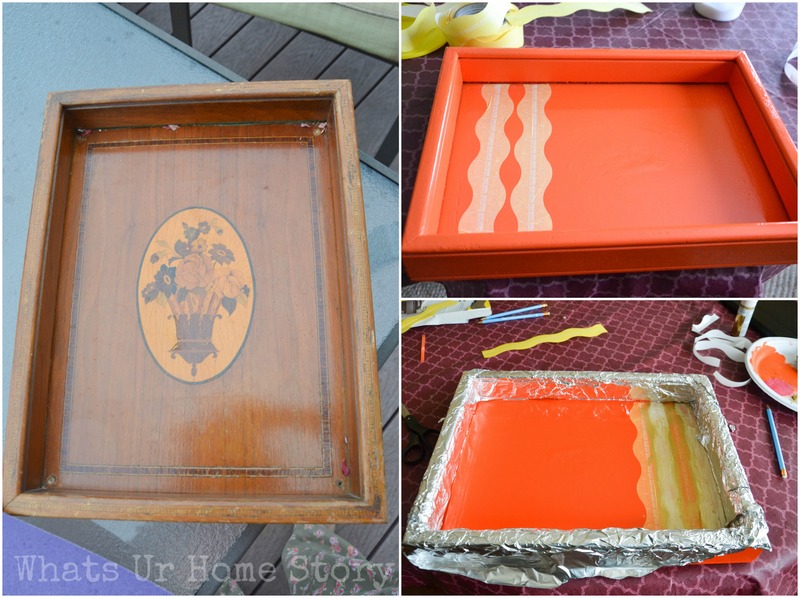 Combine that with my recent fascination with Gold I tell ya we have a winner in this DIY tray. Prep your tray for painting. My tray was in a pretty bad shape; the inlay was falling apart, there were screw holes in all the corners, dents etc. So I had to sand it down well, fill the cracks and screw holes with wood putty, and apply a good coat of Primer. Spray paint your base color, in my case Orange. Wait for it to dry overnight. Use the FrogTape’s Shape Tape to make your wave pattern. The FrogTape’s Shape Tape is so versatile that you can make any pattern you like with the wave. The tape liner is even split in half on the backside for easy peeling. This was a huge help as I could remove one half of the liner, position the tape correctly, and then remove the other half. I ended up cutting the tape down the middle for some waves so I could make them closer. If you are using spray paint for both your colors then you will have to make the waves in the following pattern : First take – 2 waves with 2 strips of tape. From then on wait for the wave to dry and paint one by one. Once you have positioned the first 2 strips correctly cover the rest of the area with Aluminum foil. For the center part you could tape the foil down with painter’s tape. I tried to paint the waves with a brush without much success (as the Orange base coat was a Gloss finish) and ended up using spray paint. Spray paint just the waves with your 2nd color, Gold. As soon as you are done, peel the tape off. Thanks to FrogTape’s Shape Tape‘s patented PaintBlock® technology where it is treated with a super absorbent polymer that reacts with the water in latex paint and instantly gels to form a micro-barrier that seals the edges of the tape, the edges stay clean and crisp. Once the waves are completely dry tape down your next wave, repeat the last 2 steps as needed till your pattern is done. The 3 different patterns that FrogTape’s Shape Tape comes in; Wave, Chevron, and Scallop make it easier to create projects that fit any decor. For the pics, I just dressed it up with a butterfly bush flower from my garden and some Birch branches. The tape is available at your local Menards and participating Lowes and Walmart stores. You can follow Frog Tape® on Pinterest and Twitter for more project ideas using Shape Tape™. What will you create with the Shape Tape™? Which pattern do you prefer? You can see my other Frog Tape project here. I love the color combination and the amazing update! Great job. Wow, you really transformed this one! The colors you chose are gorgeous and the shape tape made it so simple! It doesn’t even look like the same tray. LOVE IT! I know, even I was surprised of what a difference some paint makes. Thank you! Absolutely gorgeous! Love the orange paint!! That looks wonderful! Thank you for sharing. Love this! So fun and summery! Thanks for sharing it. Vidya, Love this orange and gold. WOW! I have never even heard of Frog Tape, do they make anything to make Chevron Patterns easier? Even better Jami. They have a Chevron tape! 🙂 The tape itself is a chevron. All you have to do is paint between the tape lines!